One of a handful of so-called “insta-unicorns,” Domo—the Utah-based business intelligence startup—quietly raised enough of an investment to net a billion dollar valuation before the tech world had fully taken note of it. But with the company now valued at $2.28 billion, and apparently gunning for an IPO in 2018, investors and rival BI players alike are taking the company very seriously. Today, ProfitWell CEO Patrick Campbell and General Manager Peter Zotto analyze how Domo's pricing page helps (and in some cases hinders) buyers as they navigate the complex world of business intelligence. It's a strong effort from Domo, hampered only by overreliance on intangible value metrics and a chronic underselling of valuable features. Digging into the data, there's a clear relationship between a buyer's interest in business intelligence and their willingness to pay for a solution. 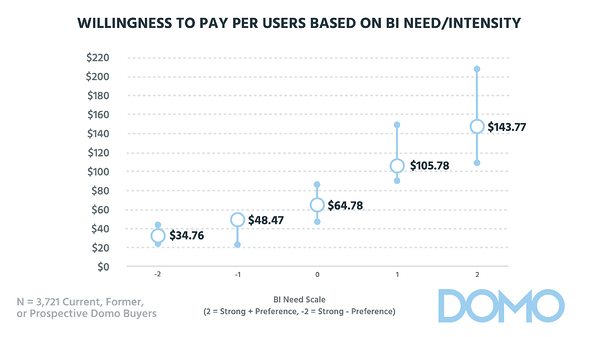 At the top end of the spectrum, a high-need buyer's willingness to pay aligns well with Domo's top-tier plans: If they have a solid understanding of their need for BI, they'll be happy with Domo's pricing. But a real problem arises when we consider the type of people who typically make purchasing decisions. Most business intelligence purchases are driven by classically nontechnical roles: execs and members of the C-suite who want to push their organization away from spreadsheets and toward data collection, graphs, and reporting. But, like most people, these execs often have no idea what the practical difference is between 5 million rows of data and 250 million rows of data. Once the order is issued to find a unified BI platform, a company starts hunting around, looking at solutions from the likes of Domo, Looker, and Periscope Data. But as it currently stands, Domo's pricing page offers little guidance for these nontechnical buyers, leaving them to make their decisions based on inaccurate heuristics—often choosing one package over another simply because it offers more data records. But as we discovered, more isn't always better. When we surveyed different buyers about their relative preference for data records, technical buyers—those best positioned to understand their company's actual data needs—preferred 100 million and 250 million records over 5 million or unlimited. In contrast, nontechnical buyers—often those people driving BI purchases—expressed a clear “more is better” attitude, ultimately preferring unlimited data rows. Left unchecked, this could lead to buyers overpaying for records they won't use. It breeds conflict between the technical and nontechnical employees, and ultimately, creates a real churn risk. 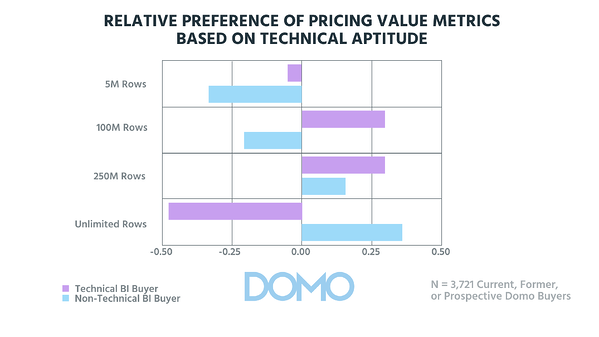 This dichotomy between technical and nontechnical buyers is a common problem in B2B, but in Domo's case it's an easy fix: Each package just needs additional context about the type of company that would benefit from it. Instead of leaving buyers guessing, the Professional and Enterprise plans should make their appeal crystal clear, touting “Best for Mid-Markets” or “Designed for Enterprise Orgs” as appropriate. In Domo's infancy, its features and pricing were shrouded in mystery, requiring would-be customers to sign an NDA before arranging a demo. For an early-stage startup, that may have been a smart move: A big influx of tire kickers—low-quality leads with minimal purchase intent—can easily overwhelm a fledgling sales team. 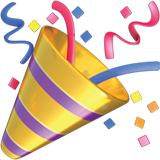 But now that Domo has scaled and achieved operational efficiency, it's in good shape to handle leads of all sizes. Now, Domo's opening gambit is a free trial: a clear, low-friction offer designed to maximize lead generation. After the free trial comes Domo's only paid self-serve option, its Standard plan. At $83 per user, per month, and with a cap of 20 users, it provides a clear indication of the types of businesses that would benefit from the plan: small teams that really care about BI. So far, so clear. But here's where it gets interesting. Despite a lot of information on the page—though thankfully not a repeat of the Salesforce disaster—it's clear that data is the main differentiating factor between the four packages: data connections, data storage, and data refresh rate. Beyond the clear-cut segmentation of the Standard plan, it's going to be pretty difficult for prospective customers to work out how many rows of data—and which pricing package—they need. Thankfully, they don't have to: Both of Domo's big-dollar Professional and Enterprise packages use a “Contact Us” CTA, directing leads toward a sales rep who can help make the right recommendation on a case-by-case basis. 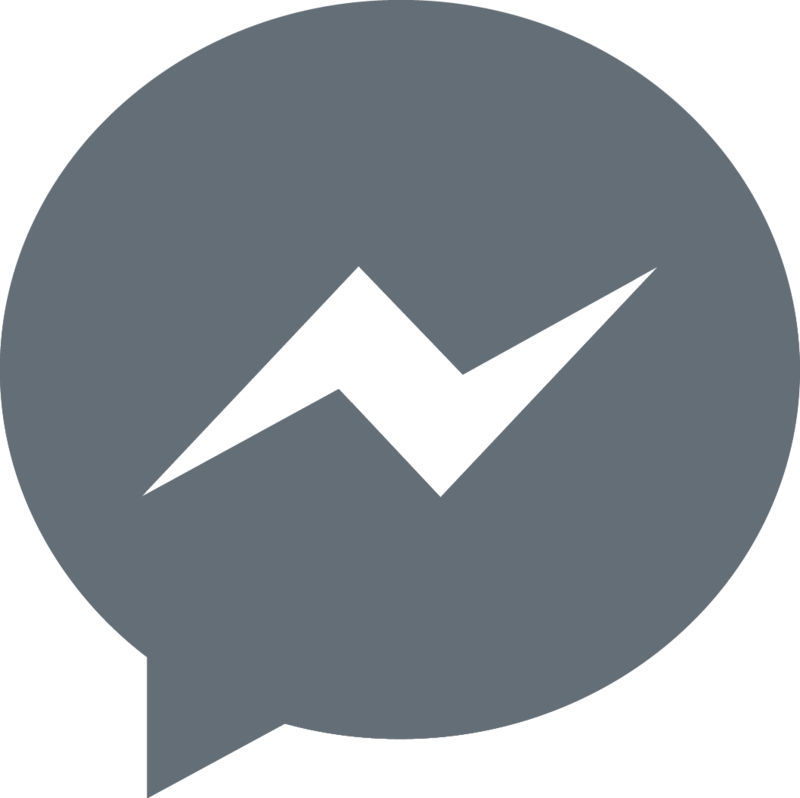 In many ways, the Free Trial functions as a “starter pack”: It's a taster of the company's service that naturally segues to a sales conversation and, depending on the customer's needs, potential upselling opportunities for the higher-end packages. The decision to tie top-end pricing packaging to features like on-demand data refresh is justified by a wide appeal and a high willingness to pay. 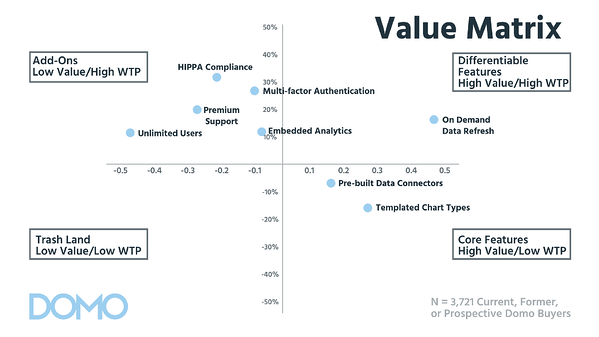 Features like HIPAA compliance and unlimited users were more binary in their appeal, but those who did care about the features also showed a strong willingness to pay. 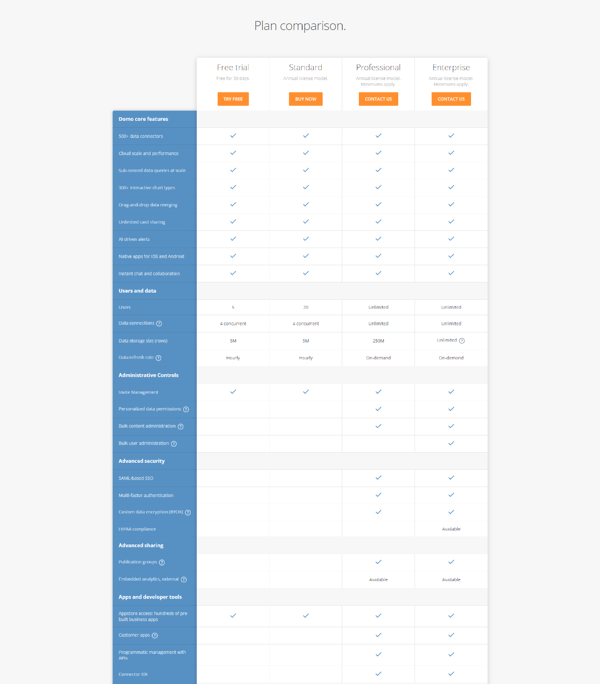 Many of the features bundled in Domo's Professional and Enterprise packages could function as lucrative add-ons without undermining the appeal of the core product. Features like HIPAA compliance—those that are relatively niche in their appeal but are incredibly valuable to the few people who do need them—are perfect opportunities to add additional revenue and upsell existing customers. Right now, Domo is crushing it—but business intelligence is a winner-takes-all market, and there's no guarantee that the company's hot streak will continue. The BI market is still relatively unrefined, but as it matures, demand is going to move away from simple data visualization and accessibility and toward actionable, vertical-specific data solutions. In the future, the small changes we've suggested to Domo's pricing page might just unlock the edge they need to dominate the business intelligence market. With an IPO looming, every little bit helps.